This type of analysis, as well as embracing Morris’s model (3 branches of semiotics: semantics, syntactics, & pragmatics) allows all the elements to be identified individually, collectively along with the spoken words, and what they mean can help each of us become more effective communicators regardless of what we do for a living. Also, in my case, it allows me to be a more effective researcher. Social semiotics explores resources (“signs” in most versions of semiotics), or action and artifacts we use to communicate (van Leeuwen, 2005), to identify them as well as explore how they are used. It is the concern of “how” that is unique to social semiotics and what I argue is most effective for exploring the role of nonverbal communication. Yuri Lotman describes all the resources, and for the purpose of this article the resources are all the potential nonverbal elements, as being in a semiosphere- all the space surrounding us. "There is no escape from signs. Those who cannot understand them and the systems of which they are a part are in the greatest danger of being manipulated by those who can. In short, semiotics cannot be left to semioticians." Nonverbal elements are present regardless if you know it or not. In order to understand these elements, they need to be identified and a system needs to be created to understand there meaning. Social semiotics emphasizes the importance of context and when viewing this from a nonverbal communication perspective, identifying the various cues and elements requires the context to have a focal point. Returning to Morris’s model, proper identification of all the elements exists through using his three branches: semantics, syntactics, and pragmatics. The image below lists the stages I use during nonverbal communication research (specifically gestures are shown below) to assist me. Semantics. The first step is to identify all the nonverbal elements. As previously mentioned [here], there can be many elements and it can easily overwhelm someone trying to identify them. This can be the case for a research and even more so for the casual interested person. To assist in this process, I created the METTA acronym to assist me (and you!) to ensure each element is accounted for. METTA represents each of the nonverbal elements: Movement, Environment, Touch, Tone, and Appearance (read more on METTA here). Pragmatics: This stage cannot be completed without the other two. This stage allows meaning to be established with each of the elements based on clusters and context. Continuing with the example above, each of the elements, while being viewed collectively tells me that the person is not “fine” and that it is worth further exploring and asking the person how they are doing. Something of importance to note is although it is listed above as steps, it is not a strict chronological order of stages but rather an interconnected diachronic process where each stage is being conducted with the other stages in mind and happening simultaneously. This process of using a social semiotic analysis can be used to assist researchers (I am doing as part of my PhD) as well as professionals and anyone interested in being aware of nonverbal communication as well as being more effective at using nonverbal communication and understanding other’s use of nonverbal communication. As Chandler mentions, an admission of any semiotician is acknowledging a semiotic analysis is just one approach of many. 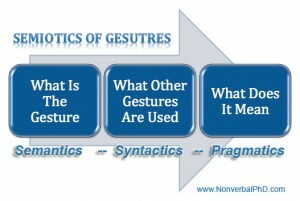 For me, exploring nonverbal communication from a social semiotic approach has helped me with my research as well as during many trainings and workshops I have conducted in various countries. I invite you to try (and let me know how it goes) as the best way to learning anything is to try it out, reflect on it, and share it with others. This articles is part of a series for Semionaut.net explaining semiotics and nonverbal communication based on the author's PhD research at Griffith University Law School. Non verbal communication , i.e. body language is such an under represented area. Thanks for bringing our attention back to the body. As with mindfulness, our own awareness of our selves (within) and the other can have significant influence to our interactions. Sounds great, Jeff! Well done! Occupiers have also been seen waving our fellow editor Josh Glenn’s book The Wage Slave’s Manifesto.